two-dimensional free particle is locally equivalent to the two-dimensional Kepler problem. not be conn ected via a point tran sformation. 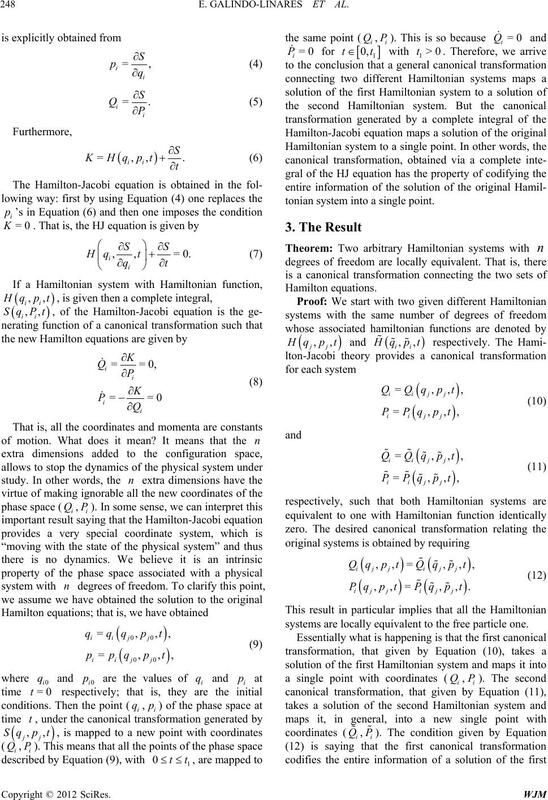 astonishing properties of the Hamiltonian formulation. pler that the original ones. 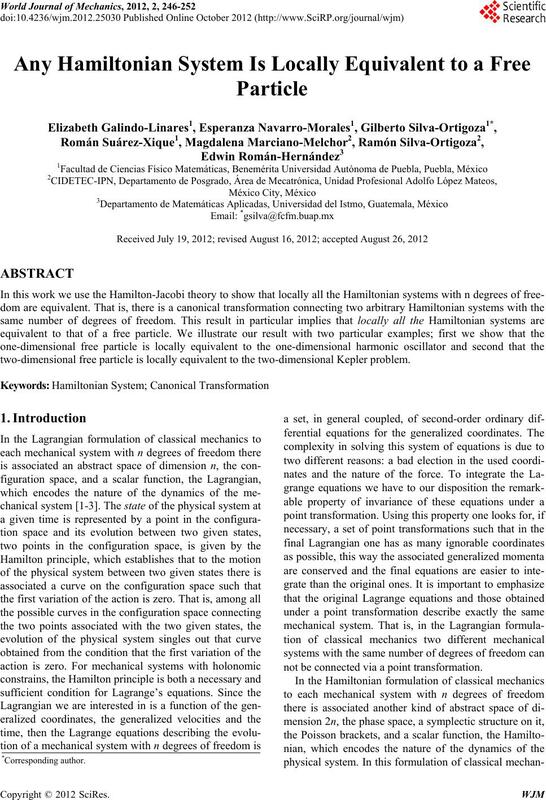 in the Hamiltonian formulation of classical mechanics. 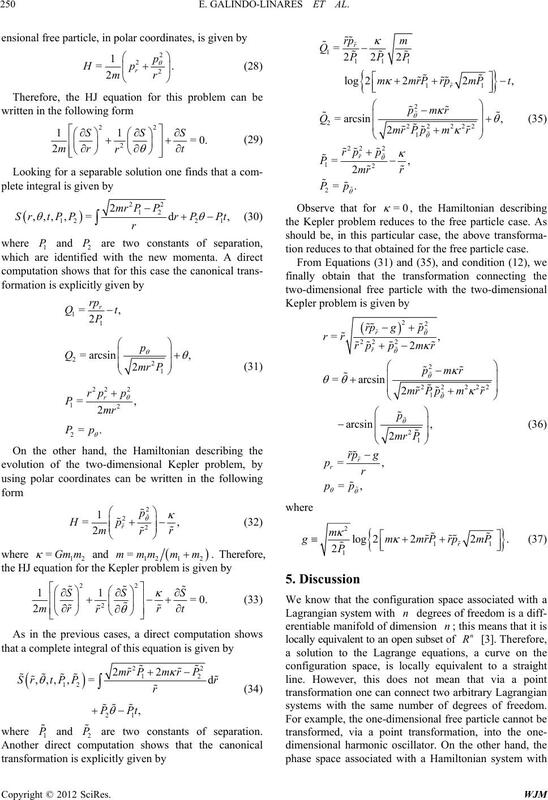 cle is equivalent to the two-di mensional Kepler problem. systems as we do here. present our fin al discussion. tonian system into a single point. systems are locally equivalent to the free particle one. systems, we use the condition (12). Observe that this transformation is not one to one. where 1 and 2 are two constants of separation. tion reduces to that obtained for the free particle case. systems with the same number of degrees of freedom. systems describing two different physical situations. 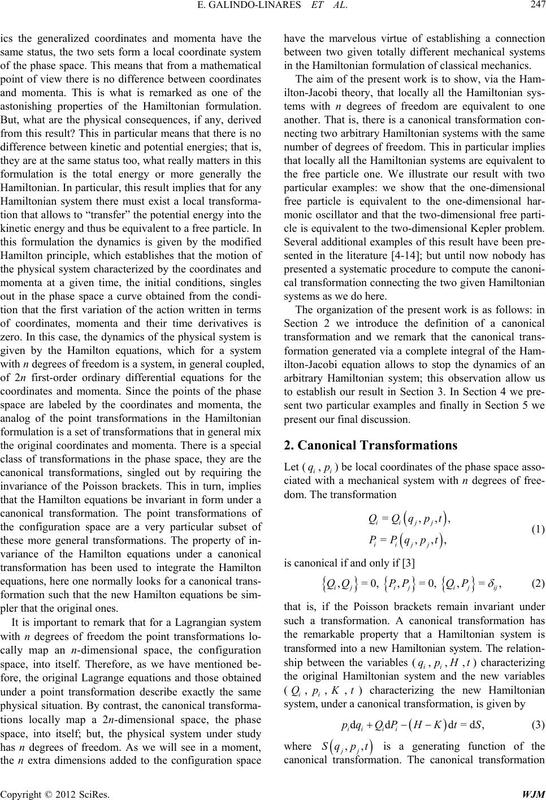 cannot be found in the Lagrangian formulation. 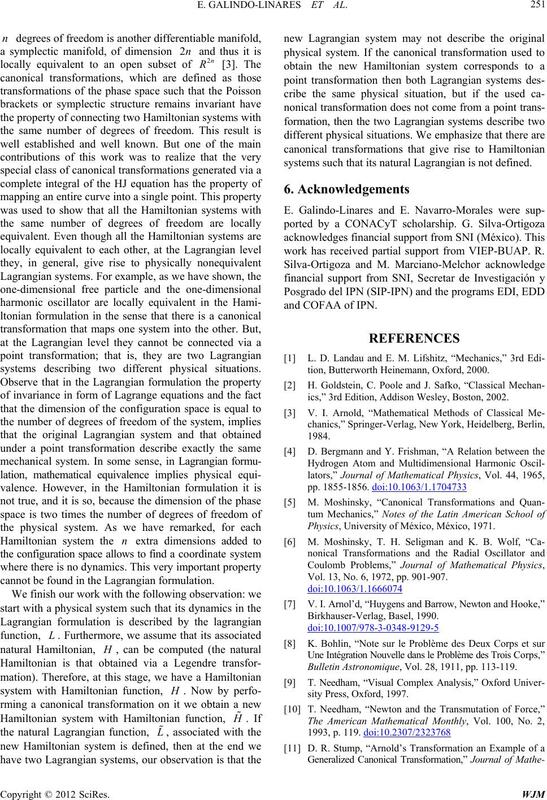 systems such that its natural Lagrangian is not defined. work has received partial support from VIEP-BUAP. R.
tion, Butterworth Heinemann, Oxford, 2000.
ics,” 3rd Edition, Addison Wesley, Boston, 2002. Physics, University of México, México, 1971. Vol. 13, No. 6, 1972, pp. 901-907. Bulletin Astronomique, Vol. 28, 1911, pp. 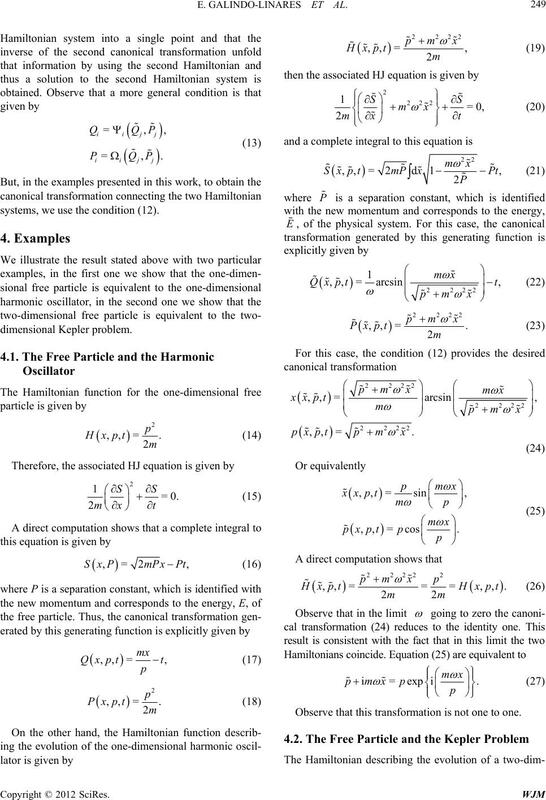 113-119.
matical Physics, Vol. 39, No. 7, 1998, pp. 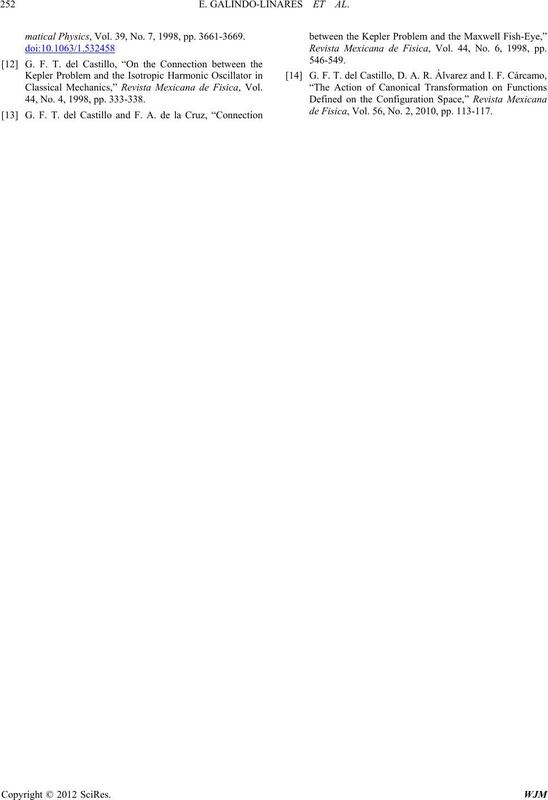 3661-3669. Classical Mechanics,” Revista Mexicana de Fisica, Vol. 44, No. 4, 1998, pp. 333-338. Revista Mexicana de Fisica, Vol. 44, No. 6, 1998, pp. de Fisica, Vol. 56, No. 2, 2010, pp. 113-117.